Join us at the Festival that attracts more than 140,000 book lovers each year. With previous appearances at KidFest, Kid City and at Festival of Books on the Reading By 9 stage, this year Bunny makes a special appearance at the Festival of Books to sign her award winning books. 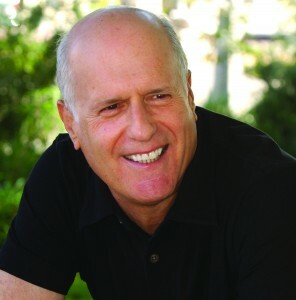 Join Etan Boritzer, best-selling author of the What Is series and Bunny Hull Grammy winner and award-winning author of the Young Masters Little Wisdom book and music series at booth #543 on the USC Campus. The School Library Journal call’s Bunny’s books “…treasures to share…” Join us for some fun and maybe even a song or two, visit Booth #543 in the children’s area. See you there! To locate USC on Yahoo! Maps or similar mapping software, you may use the intersection of Exposition Blvd and S Figueroa St, Los Angeles, CA 90089. Los Angeles Times Festival of Books’ 2011 Change of Address. For information on attending, see our Attendee FAQ. Parking at the USC campus will be $10. Please go to the Getting There page for a detailed map. Dream A World Education, Inc., a non-profit and educational outreach of Dream A World begins work in two Los Angeles inner city schools next week – Selma Elementary and Gardner Elementary. 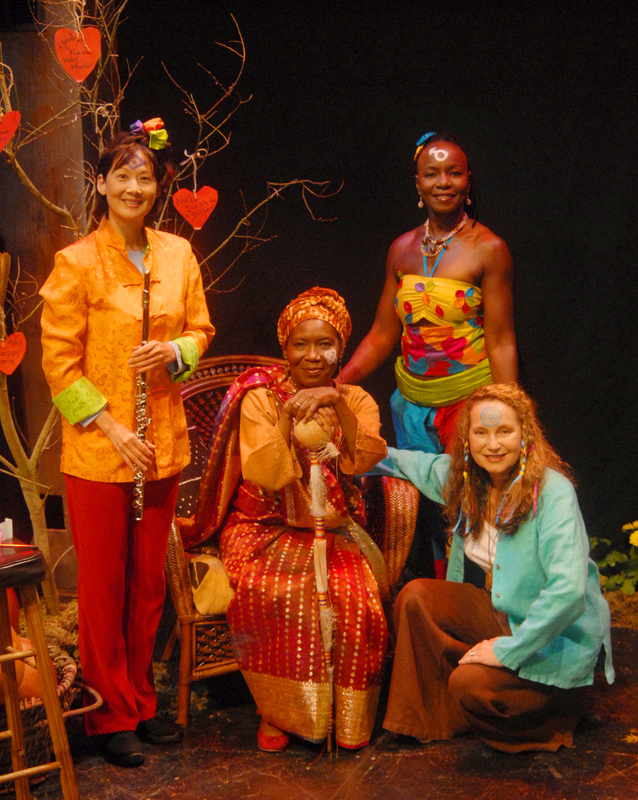 The Secrets Of The Heart residency program is an “arts based socialization program” says Dr. Margaret Martin, founder of Harmony Project in Los Angeles. “Our program uses multi-disciplinary arts: music, dance, theater arts and visual arts to teach kindergarten children that they’re born with gifts they can learn to use” says Dream A World’s founder and Executive Director, Bunny Hull. The program pairs each art form with a complimentary value: friendship, kindness, imagination and gratitude. “I promise to use my gifts everyday, in every way – for I am a Young Master.” This is the pledge that rings from the opening performance of each residency, through to the beginning and end of each workshop as children learn they are Young Masters. Why? Because they are all born with special gifts. In six weeks, they will begin to learn what those gifts are and how they can use them. Grammy award winning songwriter, Hull uses music and songwriting to the teach children about friendship, as they learn the elements of a song and how it’s constructed. They create their own class song about friendship. 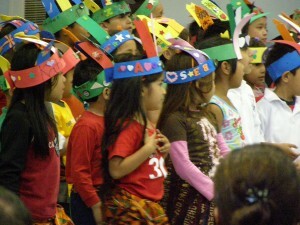 “They learn vocabulary, they learn about the ukulele, the elements of song, rhythm and they learn language arts. It’s well constructed, very rich curriculum,” says Hull. 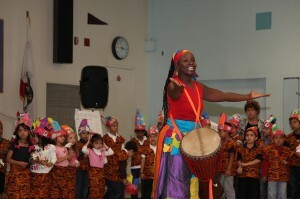 Anindo Marshall, who is from Kenya, teaches the children about kindness through dance and body movement. They learn where Africa is, a Liberian folk song and dance about welcome and the importance of showing kindness to people around them. Marshall a well-known vocalist and drummer from Kenya to Los Angeles heads an all women group called Adaawe and currently teaches at Debbie Allen Dance Academy in Los Angeles. 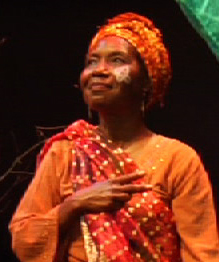 Award-winning actress Elayn J. Taylor teaches imagination through her workshops in theatre arts and storytelling as the children learn to step into a Diego Rivera painting and observe their surroundings, feel, smell, touch, listen and then learn that they each have their own story to tell. Finally, actress Diane Hsu, former flutist with the Seattle Philharmonic, leads the workshop in visual arts and music as the children learn about hats and head dresses from around the world and then create their own Young Master headdresses decorated with things for which they are grateful. They learn line, color and design, and experience Hsu’s expertise on the flute, as rhythms and music are cleverly woven into the visual arts lessons. There is a professional development component offered to teachers prior to the residency to familiarize them with elements of the program, leaving them with activities and resources they can use. “This time around we have added a parent workshop the week before the residency begins,” said Hull. “I wanted to give the parents an opportunity to participate in what their children are learning, to develop a process of communication throughout. So we’ve added an orientation and arts component where parents will work with their children at home to create a vision board during the six week residency.” There are tools offered and ideas for how parents can talk with their children about the secrets of the heart, what questions they might ask to enrich their child’s experience. Dream A World’s music and books are used as classroom resources and part of the curriculum during the course of the residency. Teacher cooperation is vital to the success of this program and the books are used for classroom discussion as children chronicle their own progress in a journal each child receives. In six weeks this program makes a profound difference in the lives of these kindergarten students, teachers and parents. It only takes one experience to touch a child’s life in a way they never forget. This program offers that experience. Because of cuts in arts funding, this program is now totally dependent on funding from outside sources. 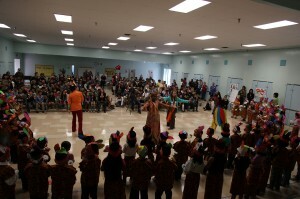 To find out more about Dream A World Education, Inc. and Secrets of the Heart visit: www.dreamaworldedu.org. The Orange County Children’s Book Festival, in it’s 8th year with up to 30,000 visitors, promotes literacy and features books and activities for kids. 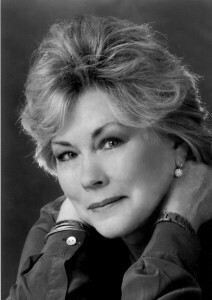 Award-winning children’s author and Grammy Award winner Bunny Hull will perform and read from the award-winning Young Master’s Little Wisdom Series at 11:50 on the Story-telling Stage sponsored by PBS-SoCal. 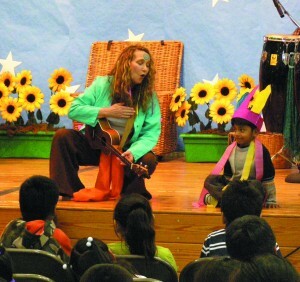 Hull, currently conducting the “Secrets Of The Heart” arts residency program for Dream A World Education, Inc at Selma Elementary in Hollywood takes a break from three classes of kindergarten students, to make a rare author appearance where she shares one of her secrets from Young Masters: The Little Light. Hull’s background in the music industry as a songwriter and top vocalist for entertainers like Michael Jackson, Quincy Jones, David Foster, Celine Dion and more make for a rich addition to her role as children’s author and educator. The O.C. County Children’s Book Festival is on Sunday, October 2nd from 9:30 am to 4:30 pm. Admission and parking are free. 1. If you didn’t write as a child, then when did you start writing and what inspired you to start? I came to writing rather late. I did like inventing stories as a child, acting out television screenplays,(my courtroom dramas were very Perry Mason) and always enjoyed creating musical extravaganzas in my room. I was not one of those kids, however, that said, “I want to be a writer.” Actually, I remember wanting to be an ice skater, a ballerina, or a singer in musicals or opera. Once when I was grade school age, I sang the Sempre Libera, from La Traviata so loudly while in the bath that my parents came running, confusing my coloratura for cries of pain. 2. How do you choose the topics for your books? Choosing a theme seems to come from another part of my brain. I have to do a lot of ruminating to get the story going that way. As this may be due to a lack of experience, I have started doing small writing exercises to practice working that way. 3. What’s your age range? I have to date, only done picture books but am working on several projects for other age groups. I never seem to be short of ideas but taking those ideas and working them into good stories is, of course, what it is all about. I keep lists. I have a list of first lines, last lines, clever names, and a list of titles that pop out of nowhere. Usually, the things on the lists have no connection to anything, but I am learning not to let any of them escape. 5. Have any of your stories been inspired by real people or events? What inspires you to write? Sometimes I’ll see something on the news or read about it in the newspaper and think, “Ooh, there is a story in there.” I think I am so clever but when I research a bit, I find that others too thought it was a great idea. At least I am in good company and it still goes on a list because what I might have to say about it at some point is probably very different than what others have said. Children inspire me the most. 6. Do you enjoy researching or do you prefer working totally from your imagination? Research and imagination seem to work together for me. I am always checking, verifying, rethinking bits and pieces of all stories, but fiction, thus far has been more interesting. 7. Do you work on more than one book at a time? When I was a student I used to do my homework on the floor, books fanned out in a half circle in front of me. I would work on one subject for a while and when I felt myself disengage, I would move on to the next subject. I would go round and round till I had finished everything. It is definitely not a system for everyone. I spent years hearing complaints about not staying focused and not finishing what I started, blah, blah, blah… But I was focused and I did finish, just in a different way. I do that somewhat with projects, but I have to be careful to recognize the difference between disengaging and running away from a spot in a story. Sometimes, I just need to write through it or around whatever is in the way. When I start thinking dusting might be a good idea, however,or ironing, I know I am in trouble. I am working on a concert story with a composer friend and I’ve almost finished the first draft of a collection of stories for my publisher. There is a novel waiting, no nagging to be worked on and an opera libretto sitting on the back burner. 9. Are you signed exclusively with a publisher? Are you self- published and how does that work for you? I was very fortunate to meet Michael Neugebauer of minedition. Minedition is a small international house that creates beautiful picture books. I have done all of my picture books with him. 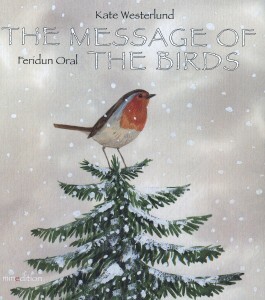 I have also had the chance through minedition to translate a number of amazing books from German to English and have also adapted several books from wonderful Japanese writers/illustrators as well. I have learned a great deal about writing and publishing this way. 10. Do you write every day and do you have set hours that you work? I write something every day. I get up very early so I can keep the outside world at bay and concentrate on the world of my stories. Some days I am more successful than others in what actually gets accomplished, but if I don’t write something at my computer, I am lost in thoughts that never get properly articulated. Translating is a delicate balancing act. Integrity and respect are things that I strive to maintain. There is the linguistic aspect, of course, and the cultural integrity that must be preserved. An Austrian author told me once that my translations of her work were like putting her words in another musical key. I have always remembered that. As literature for children becomes more global; it shouldn’t be homogenized. What would be the point? It is the very differences that we should be sharing. Translations must seek to capture that essence. Adapting can be different. To me it is re-telling the story. It has the spirit of the original with a touch of the storyteller. Kate was born in Florida, but travelled and moved a great deal with my family. She has degrees in humanities and education and started studying voice when she was fifteen. 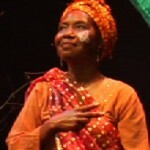 She has taught music and English in school, sung in musicals and operas and has helped to run a summer opera program. She has come to believe that if we let it, fantasy and imagination can enrich our lives and can endow us with an enviable resourcefulness and a wealth of creative thinking. She has learned much from the wisdom of children. Kate Westerlund has lived in Salzburg, Austria with her husband for over 20 years. Hollywood, California – It was a joyful day as eighty plus Young Masters at Selma Elementary recently showed what they learned and graduated from Dream A World Education Inc.’s six-week Secrets of the Heart residency program for kindergarten and first grade. Dream A World Education’s working team of artists include actress Elayn J. Taylor, flutist and actress Diane Hsu, Kenyan born drummer and vocalist Anindo Marshall and Grammy award winning songwriter and singer, Bunny Hull. Funding for Secrets of the Heart is provided by outside resources, corporate sponsorships, foundations and by individual donors who see the value and benefit it provides for children in their most formative years.. 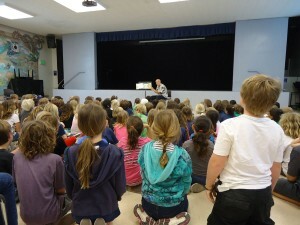 Secrets of the Heart is currently at Gardner Elementary in Hollywood and will then go to Cabrillo Elementary in January of 2012. Donna: Thank you so much for the opportunity to interview with you. We both just love your website. You offer such a refreshing and inspiring view of the world. 1. Did you write stories when you were growing up? at school? Or at home. As a hobby? As a young child, or as a teenager, or both? Donna: I did write as a child. I began when I was still in elementary school copying my favorite poems and story passages into a spiral notebook that I took everywhere. And I committed these passages to memory. Even today, 40 years later, these memorized passages spring to mind at unexpected moments. In middle school, I moved from copying and memorizing, to mimicking in my own writing what I liked in the writing of others. I didn’t know it at the time, but I was doing what all writers do – I was journaling. I began making my own observations about people or places or events that moved me, and I wrote about them, learning to use words to evoke feelings in others. To this day I journal. Sometimes it is random thoughts. Sometimes I journal to respond to a moving homily I hear at church, or to an article I read in the newspaper, a beautiful sunset, or any other topic that moves me. and A Code in da Node. 2. When you were a child did you ever have moments when you decided that you were going to be a writer when you grew up? write. It was an evolving dream of mine. More a passion. First was the need to write. It was later, after college, that the desire was born to have my writing read by a wider audience than my family and friends – hence the journey into the world of publishing. 3. How do you choose the topics for your books? What’s your age range? Rosemarie: The topics for our books were chosen because we both had a need to say what we felt. Our first book, Little Acts of Grace, was written for preschool children as a result of our desire to afford children of today the comfort of knowing, believing in and praising God. Donna wanted to share her thoughts about Mary, the mother of Jesus. 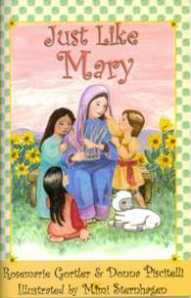 So we wrote Just Like Mary, also for very young children. Our third book, The Mass Book, was a suggestion from the publisher and targeted second graders. 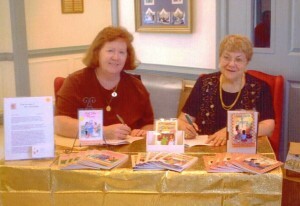 Donna: When Rosemarie and I began writing together, our grandchildren were in preschool. Our books have grown up with our grandkids. As for how we choose what to write, sometimes I think our topics choose us. Rosemarie and I are co authors, but our third partner is God. We truly feel our topics are inspired by Him. 4. What kinds of things inspire you to write? Rosemarie: Love inspires me to write. I write about people I love, people who love, and the places and memories I love. I am inspired by the joys and sorrows of everyday life. 5. What gave you the idea for your very first book? Rosemarie: Donna and I met by accident–or Divine intervention– at a church dinner. We had each been on a Pilgrimage, compared notes and soon found that we had very similar thoughts and a desire to write from the heart. We talked about little things we did as children. In spite of the difference in our ages, our memories, beliefs and feelings were so very similar. So, we wrote about how little actions displaying love for God would please Him just as little acts of love and kindness please people. And–we went on from there to create a series of books for children. 6. Have any of your books earned special recognition? Donna: Our 4th book, Living the 10 Commandments for Children, won 2nd place in the children’s category for the 2008 North American Catholic Press Association. That was a real thrill for us. Rosemarie: This same book has also been printed in Lithuanian at the request of a priest who enjoyed it while in America! 7. Have any of your stories been inspired by real people or events? What inspires you to write? 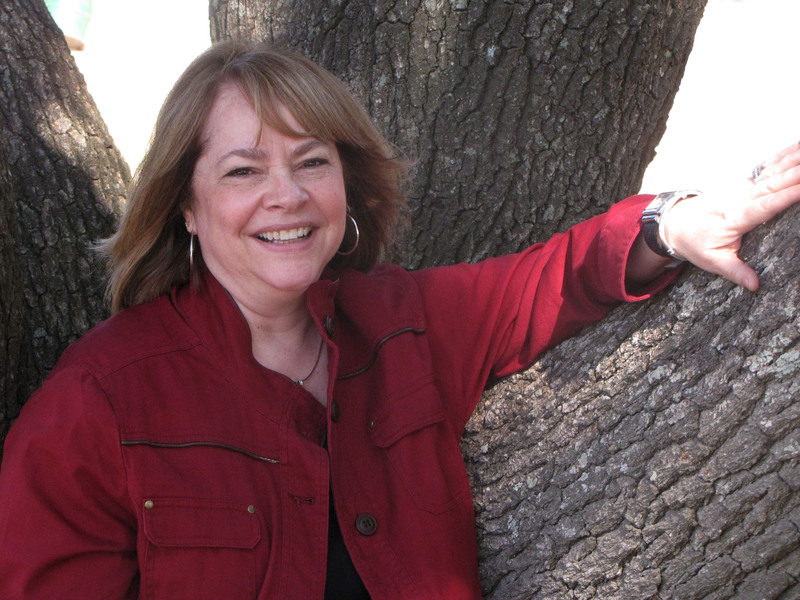 Rosemarie: Most everything I write is inspired by real people or shared life experiences. I notice that in Donna’s work also. Her love and compassion shines through her words. The book she is self publishing at this time emphasizes pre teens respecting and caring about others —social justice. Icky, CeCe and the Mysterious Mr. Thuan is due to be released at the end of November. 8. Do you work on more than one book at a time? Donna: I think this is sometimes one of our strengths, and a potential pitfall. While Rosemarie is a focused writer, I tend to work on more than one topic at a time. As a result, I am slower in brining any one project to fruition. I tend to write in response to an inner calling. Rosemarie is the disciplined one. Rosemarie: Donna and I get a chuckle out of the fact that our Myers-Briggs Type Indicator results are on target. I seek closure on each project before beginning another. Donna is comfortable beginning several projects. I believe we complement each other with these opposite characteristics. I speed her up on each project and she slows me down to make sure our words are what we really want to say. 9. Which of your books did you most enjoy writing? Rosemarie: It’s a tossup between The Beatitudes for Children and The 10 Commandments for Children. I learned a lot as we wrote about current life in relation to God’s teachings. My favorite adult piece was the story of the unexpected death of my granddaughter on the day my son came home from the Gulf war. That writing was therapeutic and helped me resolve her death. It took 2 years to write. children, this book helped me answer a question from when I was a little girl. I was always told that Mary, the mother of God, is to be my role model. I couldn’t understand how to do that. But writing this book helped me answer how we all can be just like Mary. 10. What are you working on now?Donna: We have a couple of projects we are working on. 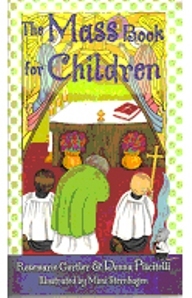 We have two children’s books: one on Purgatory, and one on Priests. I am working on a series of middle grade novels. And we are experimenting with developing one of our books as an animated book for an ipad. 11. Are you signed exclusively with a publisher? Are you self published and how does that work for you? Donna: We have not signed exclusively with any one publisher, but to date, all of our children’s books have been published by Our Sunday Visitor. That has been a wonderful relationship we hope will continue. I am also currently working on self publishing my middle grade novels. I am working on a series of 4 middle grade novels, each one which addresses a different issue related to social justice: homelessness, the plight of the refugee, etc. These books will appeal to that segment of our population who embraces conservative values. As you know, this is a small, niche market. So I have ventured into the realm of self publishing. I am working with an editor who has some experience in this area and feel confident this is a plausible way to go. With the help of social networking, Amazon and e-bay, marketing the books has become, while not easy, certainly possible. 12. Do you do school visits, if so what question do children ask you most? Rosemarie: I love doing school visits! Last year I read to a pre-school in Northern Virginia and had a wonderful time with 4 year olds. 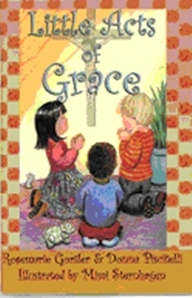 Last week, I read snippets from Little Acts of Grace 2 to the Kindergarten and 1st grade classes. They were a great audience, wanting to participate as well as listen. I also read A Really Scary Time to 3rd and 4th graders. We sang the World War ll songs from the book. Donna and I have had opportunities to speak to children and their parents at PTO meetings in the public school and at a Military base. We both enjoy talking to adults and to children. Donna Piscitelli lives in Alexandria, Virginia, with her husband Steve. They have four children and ten grandchildren. Donna has been writing and publishing children’s books for ten years, and is currently working on publishing her first middle grade novel. She has worked in the field of education for 32 years and has been a teacher, a counselor and an adminstrator. Donna and Steve are both active in their church. Rosemarie Gortler lives in Fredericksburg, Virginia, with her husband Fred. They have five children and seventeen grandchildren. Rosemarie has been a nurse and a clinical counselor. She and Fred are active in their church. Your may find Piscitelli and Gortier’s books on Amazon by clicking here. 1. When did you start writing and what inspired you to start? I wrote a little bit when I was a child but I never really thought of becoming a writer until I was an adult. What inspired me was really strange. One day I was reading my brothers blog. He was just playing around and making up a fantasy story. I thought he was really good and thought “Hey, I could do that!” So I sat down, started writing a fantasy story about something we used to play as kids and I haven’t stopped writing since. 2. How do you choose the topics for your books? What’s your age range? The age range that I find the most enjoyable to write for is 4-8 yrs. old. They are still so imaginative at that age and in love with learning new things. They also say some of the funniest things! As far as how do I choose topics for my book, it’s all up to how I’m feeling on any given day. If something inspires me, then I write about it. 3. What kinds of things inspire you to write? All sorts of things inspire me. If I hear a child say something funny, I’m inspired. If a co-worker tells me something hysterical or unusual that their child did, I’m inspired. If I see a movie or TV show where something amazing happens, that inspires me as well. Reading other books also inspires me. The world is full of inspiration; you just have to be open to it! 4. Have any of your stories been inspired by real people or events? What inspires you to write? Yes, A lot of my stories do contain something about a person I knew or an event that happened in my past. I once wrote a story about two little old ladies who lived next door to us when I was growing up. They were very sweet ladies but a little on the unusual side because they had never been married, lived in a little white house, and had hundreds of salt-n-pepper shakers all over the place. They left a great memory in my mind so I just had to include them in my story writing. I’ve also written quite a few stories about pets I’ve had or currently have. 5. Do you work on more than one book at a time? Oh yes. I don’t know how smart or good that is, but I’m usually working on at least four or five stories at a time. Sometimes it gets a little overwhelming but I find that I am constantly coming up with new ideas and just have to get them on paper. However, when you are working on so many stories at one time, it tends to prevent you from completing any one item, therefore it slows you down from getting things completed and out the door. I need to work on focusing on one story at a time! 6. Are you signed exclusively with a publisher? Are you self -published and how does that work for you? 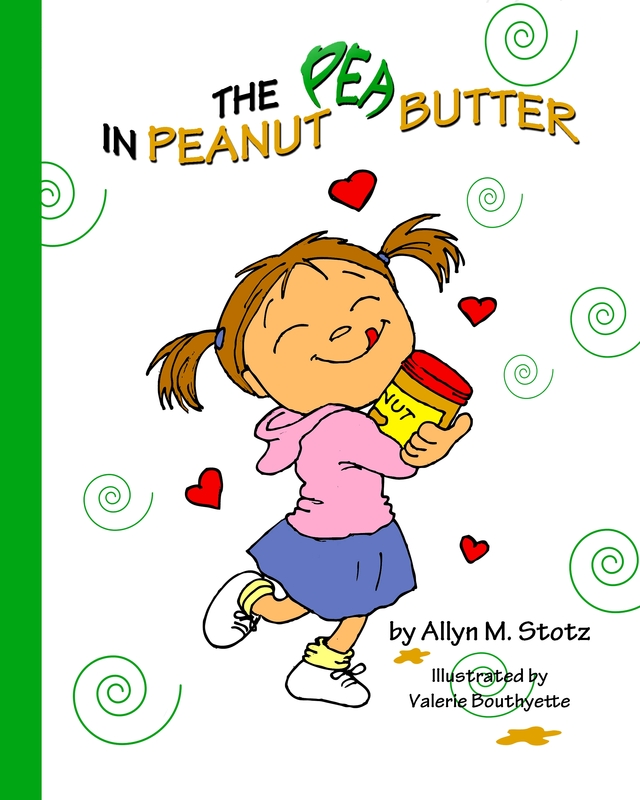 I am signed with FutureWord Publishing for my book The Pea In Peanut Butter. 7. Do you write every day and do you have set hours that you work? Where do you write? Yes, I write or do something with my writing every single day. There is so much involved with writing that it’s nearly impossible not to be involved in it every day. However, sometimes I spend more time marketing, blogging, and doing administrative things that my total time in a week actually writing is probably only four hours. It just depends on what I have going on and what deadlines I have. I don’t have set hours to write because I also work a full-time job elsewhere. I have to fit my writing time in around that. I do some of my writing at work in between busy times, and at home on my laptop in the evenings and weekends. I have a designated room to do that. 8 .Has anyone ever written you a fan letter that you’d like to share? I love the super duper, gummy yummy, sticky lickin’, and belly rubbin’ taste of peanut butter. If Mommy would let me, I’d spread it on hot dogs, fish sticks, chips, and pancakes. I’d eat it on bananas, grapes, apples, and frosted flakes. And to me, that is what it’s all about for me. Knowing that a child smiled and enjoyed my story! 9. Who was the first character you ever created and why? I don’t remember the first character I ever created because it was back in grade school. However, I do remember the first PLACE I created. It was a land of nothing but peanut butter. 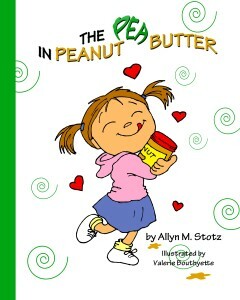 And surprisingly, my first published picture book, is about peanut butter as well! Hmmm, guess it’s a no-brainer that I love peanut butter! 10. Is there anything about yourself that you’d like to share – hobbies,where you were born, special talents other than writing/illustrating? I was born in Grand Rapids, Michigan but was raised in Edgerton, Ohio. When I turned 22 or so, I moved to St. Louis with my husband. From there his job has transferred us to Louisiana, Texas, Mississippi and back to Louisiana where we currently reside. I have many other hobbies. I read a lot, dabble around with stained glass, do interior decorating, and at work I do a lot of graphic design type things. Dream A World has submitted and essay about the work we do for and with children to Chase Bank and Social Living to qualify for a $250,000. grant. We asked for your help to qualify and you came through for us. Thank you! You can still add your votes to Dream A World up to June 30th. We need your help and it literally takes 10 seconds. If you have a facebook page. Please go our Dream A World’s facebook page. You will find the link to www.missionsmallbusiness.com . They’re posted all over the place. Click on the link. You may have to click where it says log in, but you really don’t have to log in. They’ve made it SUPER EASY. Your facebook will access their page. Then, enter Dream A World, California, Beverly Hills and VOTE! Orlando, Florida – From March 15th – March 17th Dream A World® is exhibiting at the American Montessori Conference in Orlando, Florida – Booth #227. In addition Bunny Hull, Founder and Director of Dream A World Education, Inc and Dream A World® and Stephanie Pelly, Montessori Peace Educator are teaming up to present Building Classroom Community and Character Through Music . This workshop will take place on Friday, March 15 2:00 PM – 3:30 PM. All Montessori teachers and administrators are invited to join Bunny Hull a Grammy®-Award winning songwriter for this workshop that integrates music, rhythms, and interactive games for students ages 3 – 9. You’ll learn upbeat songs, creative art projects, and lessons that enhance language development and build social and emotional skills by focusing on universal themes such as friendship, courage, and gratitude. 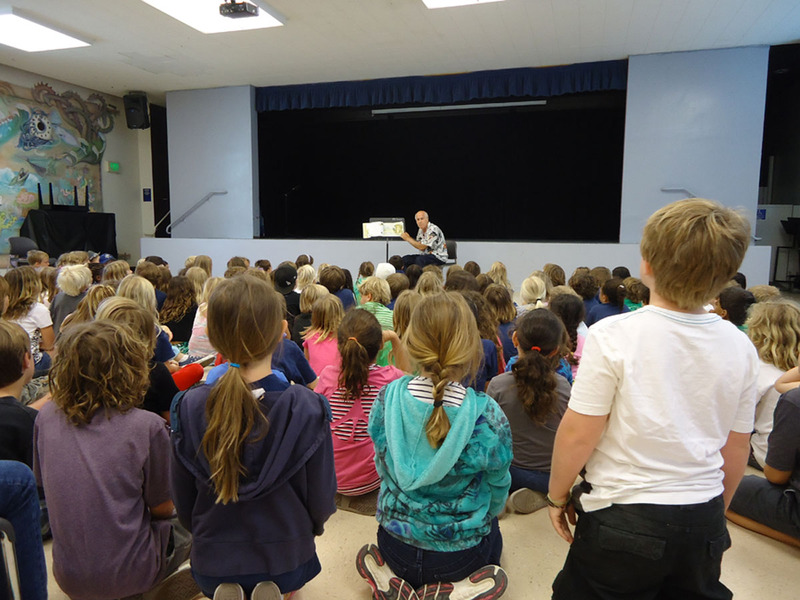 You’ll leave with new tools for using music to create a joyful learning environment and build classroom community, and you’ll see how music can be a key element in character education and peace education programs. There are currently ninety participants signed up for this workshop, so sign up now while there is still room available. 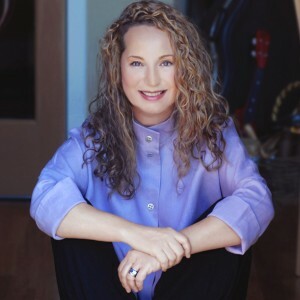 Bunny Hull is a Grammy®-Award winning songwriter and the founder and executive director of Dream A World Education, Inc., an arts education, character education, and life skills program used in public schools in Los Angeles. She has worked with children since 1994 after a career in the music industry as a vocalist, songwriter, and producer. 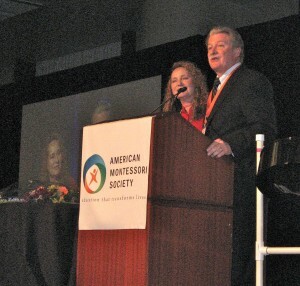 Stephanie Pelly is a peace educator and consultant to Montessori and public schools. She has worked at Naudain Academy Montessori School in Voorhees, NJ, for 14 years as an assistant teacher, camp counselor, and after care teacher.